Ultimate guide to digital painting like a PRO I. Over 15 hours of video tutorials. Digital painting tutorial: Beginner's package chapter 1. I will release the next chapter each month. You will get over three hours of Video tutorials. You will learn to draw female figures in different natural stances. You will learn to draw a character portrait from a front, side, and back view. You will learn to paint a portrait from a front, side, and back view. You will learn to proficiently work with Photoshop modifiers: overlay, multiply, dodge, and color. You will get HD MP4 files (approx: 1280 x 720) and origial PSD files. 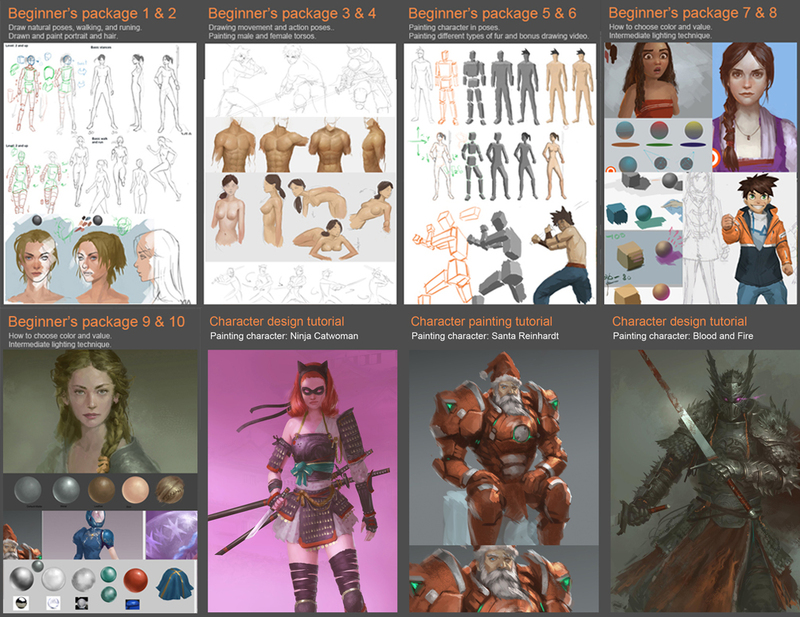 Digital painting tutorial: Beginner's package chapter 2. You will get over two hours of Video tutorials. You will learn to draw male figures in different natural stances. You will learn to draw female figures in different running poses. You will learn to paint and render hair. You will learn a quick and easy way to change character's hair color. You will learn to draw and paint stylize portrait: Lin. Digital painting tutorial: Beginner's package chapter 3. You will learn to draw figures in different action poses. You will learn to draw a character portrait from a dynamic angle. You will learn how to paint muscular torso (Pectoral and abdominal). Digital painting tutorial: Beginner's package chapter 4. You will learn to draw female's torso and breasts in different positions. You will learn how to paint female torso in different positions. You will learn how to paint female torso in different skin tones. Digital painting tutorial: Beginner's package chapter 5. Basic painting block in/render for figures and any object. This tutorial will show you the easiest and the most logical way to render using three faces box system. You will learn how to find where to put light and shadow on objects. Digital painting tutorial: Beginner's package chapter 6. You will learn to paint different types of fur. You will get bonus video tutorial, snow white portrait. You will learn how to paint simple dark hair and basic fabric. Digital painting tutorial: Beginner's package chapter 7. You will learn to pick the correct color for shadow. You will learn to make your color more vibrant in a painting. You will learn how light and shadow works in painting. You will learn how to paint a basic character. Digital painting tutorial: Beginner's package chapter 8. You will learn to basic directional lighting. You will learn to make your color harmony. You will learn how light, shadow and bounce light works in painting. You will learn how to paint a basic portrait with dramatic lighting. Digital painting tutorial: Beginner's package chapter 9. You will how materials works and why. You will learn to apply materials to your illustration. You will learn how to paint a basic character illustration with materials. 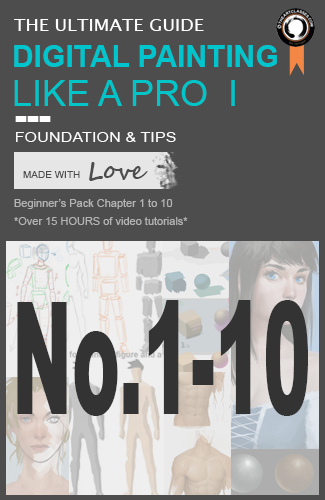 Digital painting tutorial: Beginner's package chapter 10. You will how different levels of similar materials. BONUS video tutorial 1: Ninja Catwoman. You will get over 2 hours of Video tutorials. You will learn how to quickly get your idea into a concept art. You will learn the to use the right materials and textures to further develop your digital painting skill. You will learn the quick way to create form with light. BONUS video tutorial 2: Santa Reinhardt. You will get over 90 minutes of Video tutorials. You will learn my process to create a character sketch. You will learn how light, shadow and bounce light works in figure. BONUS video tutorial 3: Blood and Fire Knight. You will learn to paint character concept within hours. You will learn to use light and shadow to create shapes and forms for armor design. You will learn to to manipulate hard edge, soft edge and lost edge for complex design.